Alan R. Moon is one of the names anyone with more some interest in boardgames knows.Few people realise that his first published game is from 1981 – a variant of the card game hearts by the name of Black Spy – but at least since Ticket to Ride, one of the best known boardgames in gamer circles and outside alike, he is one of the game authors that people may think off when asked to name one. Not surprisingly, the way from A to B has a lot of other games in between, and the first big step to fame happened quite a bit before Ticket to Ride, even before boardgames became kind of a big deal. 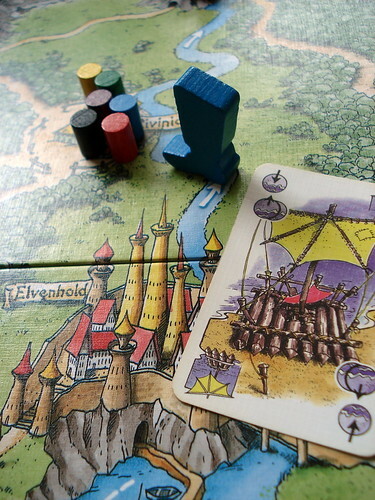 That game is Elfenroads from 1992, which was adapted into the somewhat ligher 1998 Spiel des Jahres winner Elfenland. Elfenland is a game about the invention of route planner software – only that the GPS in my car can’t take enough waypoints because in Elfenland you want to go sightseeing in 20 different cities. The cities are connected by the elfenroads which lead through four different kinds of terrain – plains, forests, deserts and mountains – and can be travelled on by various exotic means. Bicycles have never become popular in the country of elves – the ears offer too much wind resistance – and you have to go by more common local means of transport like giant pigs, sailing tricycles, the troll-cart, dragons, clouds and unicorns. Although clouds and dragons can technically fly, they are still bound by roads because air-traffic control in Elfenland is very strict. We did try to house-rule that unicorns can only be ridden by virgins, purely for realism’s sake, but somehow it didn’t catch on. To do any actual travelling, you require two kinds of resources: cards and chips. Cards are like tickets, you pay either one or two of them to travel along a road, depending on the conveyance and the terrain.Not all means of transport can go everywhere. The giant pig, for example, doesn’t go to the desert or the mountains. The unicorn, on the other hand, is shy and doesn’t dare go out in the plains. Her Majesty’s Troll Cart Service goes on any terrain, but the trip is on the expensive side, costing two troll cart cards everywhere except on the plains. Besides the six transports above, there is also a number of boat cards. Boats, shockingly, don’t travel on elfenroads but on elfenrivers and elfenlakes. The cards are dealt at the beginning of each of the four years. The chips, on the other hand, are drawn semi-randomly: there are five visible chips to pick from, but in case you like none of them you can draw a random one as well. The chips also show the different transportations – without boats here – and are used for your travel planning. When all players have their chips, they take turns placing one on a road. Only a road that has a chip on it can be travelled on by playing the matching card(s). Each road can only have one chip on it, so having someone place a dragon on the one road you desperately need when you have a hand full of trolls is about the same as having your plane grounded in a storm while your connection flight is taking off 200 miles away: not good. At least here you can play three non-matching cards to travel along that particular road. Expensive, but still better than being stuck in the middle of nowhere with a McDonalds coupon as an apology from the airline. After all players have placed their chips, the travelling itself is anti-climatic. You follow the roads with your shmeeple – that’s shoe meeple, because your meeple are indeed elfenboots – discarding cards as you go and collect your marker from every city that you pass. In the best case, you could place all your chips where you wanted them and got some involuntary help from the other players; you may be able to visit 8 cities in one round. Usually you will only pick up four or five markers in a round, so you may or may not visit all 20 cities in the four rounds the game lasts. When playing with the family, you will probably try to optimise your own route and not step on anyone’s toes on purpose. In a game like this, your chances of visiting all the cities are pretty good and the winner is often decided by the tie-breaker: cards left at the end of the game. On the other hand, when playing with more experienced players – or at least players that don’t start crying when you block their way – Elfenland becomes a lot more interactive. If you pay attention to what the other players pick and what they don’t pick from the open chips, you can make a pretty good guess what cards they have and place the most inconvenient chip in their way, forcing them to spend three cards at the very least. It’s still not a highly interactive game, preparing your own route is almost always more profitable than blocking others, but those two goals are not always mutually exclusive. If you like the concept but are really looking for something deeper, Elfenroads may just be your game of choice. All the basic rules are the same, but there is five more cities to visit and the chips are auctioned instead of drawn. If you prefer that variant then good luck in tracking down a copy: Elfenroads has been a collector’s piece for some time now. Personally, I’m not a big fan of auctioning in this case; it makes you less reliant on luck, but it also makes the game longer. 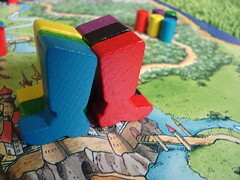 And the simpler Elfenland has aged well enough that we still play it sometimes, 13 years after it won Spiel des Jahres.